Precession causes much more than just changes in our view of the night sky. When a Mayan Great Cycle or Astrological Age changes, it affects everything on earth, including us. This may surprise you but if you really think about it, the full moon has been proven to have dramatic effects on a person's mood. Many doomsday prophecies are based on these sometimes massive cycle changes including the Mayan prophecies for 2012. The common thread that creates the uncanny resemblances between the Greek/Egyptian Astrological Ages and the Mayan Great Ages is the ancient people's knowledge of precession. Our ancestors were much closer to nature than we are today, and they realized over time that what happened in the cosmos above affected events on the earth and all life below. Add to this the Hindu yugas and you have a number of galactic and planetary indicators that point to great change coming in and around 2012. The fact is, it has already begun. "effects" of precession and "trait or value changes" that come during Astrological and Great Age changes on the Earth. The stars and constellations appear to slowly rotate around the Earth. This is caused by the earth's own rotation within the greater rotation of the universe. Like a wobbling top, the orientation of the Earth's axis is slowly but continuously changing as it traces out a conical shape over a 25,625 years cycle. This picture was created by Vectorized by Mysid in Inkscape after NASA image. About every 2,160 years the sun moves into another new zodiacal constellation. The years between constellation changes, which are caused by precession, are approximate because constellations are of different sizes. Other planets cause planetary precession due to their gravitational force on the Earth. 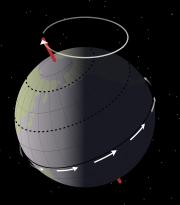 This occurs because of the small angle to Earth's orbital plane, the ecliptic. These factors cause the plane of the ecliptic to shift slightly, so the Sun crosses the Equator at a little different point every year. The Age of Leo ca. 10,970 BC to 8810 BC, The Golden Age. It was believed by many geologists that the Sphinx was constructed in the 4th Dynasty but that theory has been dispelled because the erosion patterns on the Sphinx are not of sand and wind, but clearly of water. So it's much older than earlier thought. What is most interesting is the construction of the Sphinx pre-dates civilization. Humans were still hunter-gatherers at this time. Since civilization as we know it didn't exist then, who built it? Hmmmmmmm! The fact that the Sphinx is in the shape of a lion with a human head gives it major astronomical significance. The Sphinx appears to have been created just prior to the beginning of the Age of Leo, the lion. Leo was the pre-dawn constellation in the eastern sky during the spring equinox an hour before dawn where the sun rose. The Sphinx gazes directly east where the constellation of Leo would have rose through precession of the equinoxes in 10,970 BC to 8810BC. Global warming was a major event at this time causing melting of ice caps and a rise of 300 feet in sea levels. This rise in sea level eroded the Sphinx. This all makes sense when you realize that Leo is a "Fire" sign and is ruled by the Sun astrologically marking global warming. It was also during this time that carved stone oil lamps with a continuous burn were invented, which represents light and heat. The Age of Cancer ca. 8600 BC to 6450 BC - The Age of the Great Mother. The feminine was revered at this time as the creator of all life...birthing, nurturing and protecting. This is the age of the goddess and is ruled by the Moon. Cancer is a water sign and people started to realize the connection between the tides and the moon. Massive loss of coastal areas was still in effect on earth from the elevated sea levels. Civilization and the domestication of farm animals like pigs, goats and bees began at this time. Various food plants were also domesticated starting the agricultural era. Cancer is associated with the home. People started to settle into permanent dwellings. The transition seems to have been everywhere with the development of civilization in Sub-Sahara Africa between 9000-7000 BC. These areas went from being largely nomadic hunters and gatherers to a settled domesticated lifestyle. There's evidence of the widespread use of boats representing Cancer's water sign. An increase in the making of pottery signifies the protective vessel, which is one of Cancer's archetypes. The Age of Gemini ca. 6450 BC to 4300 BC - The Age of Communicate, Trade and the Twins, duality." The role of men and women in reproduction was starting to be understood. Adam and Eve came into being at this time, presenting duality and the division between the masculine and feminine energies within. The transition was starting to move away from the feminine as the revered symbol. Language and symbols were coming into being, making this Age a time of writing. Trade between cultures started to accelerate. the constellation of Gemini was seen as two people holding hands, which could have been symbolic for trade and communication as well as duality. The wheel was used for the first time for transportation. Shakti Energy (Milky Way), and how the energy moves through the signs and the chakras was starting to be understood. Also, how the Universe is the same as the body was recognized. All are connected. The Age of Taurus ca. 4300 BC to 2150 BC - The Age of Earth, Agriculture and the Bull. Bull worshiping cults began to form in Assyria, Egypt and Crete. The building of pyramids began signifying the bull through solidity, stability, and attempts at eternity. Figures on Egyptian pyramids and temples had bull's horns at this time. Avatars were now here, and there are more attuned individuals or spiritually realized people. Taurus is associated with the smelting of copper, tin, and bronze. Swords came into being in the early phases of this era. Papyrus was invented enabling improved writing techniques. One can envision within the Taurus glyph the image of the partially unrolled scroll. Many of the traits representative of Taurus start to appear such as stubbornness and strength. But on the other hand, sensuality can also be seen as in the Ancient Egyptian civilizations. In fact the sacred bull, the Apis, was the Egyptian symbol of life. The followers of Moses worshiped a golden calf when he descended from the mountains with the ten commandments in this time period. The Age of Aries ca. 2150 BCE and ending about AD 1. - The Age of War, Fire and the Ram. People revered the sun in Egypt. Aries represents a Fire symbol as well as bold actions. The Ram is the patriarchal society of butting heads. This age is known for courage, initiative, war and adventure. The Chinese, Persian, Greek and Roman empires expanded during this age. Aries is associated with the metal iron, which was smelted and made into swords at this time, replacing bronze. There was an upsurge in originality with the development of the sciences and the arts. The earliest attempts at the idea of one God came into being with Akhenaten, an Egyptian Pharaoh about 1350 BC, when he decreed the Sun God Aten, as the supreme deity. Freud felt that Moses was inspired to embrace the idea of one God who favored his people through Akhenaten's lead. Hackear, the goddess who dressed like a man, built Carnack temple in Egypt. She knew the age of the goddess was coming to an end and masculine dominance was coming in. Luxor temple was built at this time. It's the body of a human with the different chakras. And, it's possible that during the transition from Taurus to Aries, Moses condemned his people for worshiping the golden calf. It was Moses who used his will to part the Red Sea. The sacrifice of Abraham's ram occurred most likely at the end of the Age of Aries. The Age of Pisces Recent Age just ending: AD 1 to AD 2150 or less - The Age of Monotheism, Spirituality and the Fish. The Age of Aquarius Began about 2012 or will possibly 2150 - The Age of Freedom, Technology (especially electricity), and the Water Bearer. There is some dispute about when the Age of Aquarius begins. Some astrologers place it as far out as AD 2600. To read about the changes that occurred during the beginning of our present Great Age, in my article on the cultural changes around the world in 3100 BC. 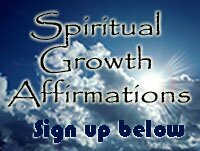 The goal of God/The Universe is to create a perfect human being through our evolution of consciousness. At the beginning of each new age, the tendencies from history are reset and replayed. These tendencies are reintroduced with the values of the new Astrological or Great Age in a continuous cycle. These precession cycles will continue till the goal of the divine is achieved. There are negative as well as positive traits to each Astrological sign and Mayan Great Age. It's up to us to figure out which we choose to live by...the positive or the negative. What we choose will be our experience.